Kitchen island is a place where you hang out with family and friends quite often. It’s a place where you engage in light conversations while preparing a meal or fixing up fancy cocktails. So it’s natural that you want this area to be one that reflects your style and creates a great ambiance. Kitchen island pendant lights are a great way to enhance this space and they can even double up as conversation starters. Here’s our hand-picked selection of the 10 best kitchen island pendant lights that are like modern pieces of art. This 6-Light Kitchen Island Pendant is perfect for an Industrial themed Kitchen. With clean lines and a casual style, it adds a young appeal to any space. It will also go perfectly in a Dining area setting with iron and wood furniture. The faucet inspired design is cool and sets it apart from the ordinary. Buy this Now. This sleek pendant light for kitchen Island is designed by “Lightings Modern Master”, Robert Sonneman. A minimalistic kitchen island pendant light, this is for those who like to keep things minimal or contemporary. Available in three color options, white, black and aluminum grey – this kitchen pendant can match pretty much any contemporary setting. Buy this Now. This 12-light kitchen pendant light from CWI Lighting is modern and futuristic. The chrome ceiling plate with height adjustable hanging rods and the pixel pattern crystals are perfect together. Dimmable and easy to install, this one is ideal for any dining space. Buy this Now. This highly rated vintage industrial design Kitchen Island Pendant is punctuated with clear seedy glass shades, reminiscent of glass jars that were a staple of 19th century American life. The carbon filament replica light bulbs enhance this style, making the fixtures the perfect addition to any spaces. Capable of lighting up a vast space but also dimmable, it’s suitable for a variety of spaces beyond the kitchen island. Buy this Now. If you want to make a big impression, then this kitchen island pendant light is what you need. The unique designing and silver chrome finish gives it a luxurious feel. This 5 light metal chandelier can add a hint of artistic glamour to a modern kitchen. Buy this Now. The two-tiered strands of translucent capiz shells make this chandelier stand out. Moreover, the neutral hues of shells in this kitchen pendant blend with any decor. Add a hint of coastal style to your kitchen with this 5 light steel chandelier. It also comes with 10 W LED bulbs to save you a trip to the hardware store. Buy this Now. These industrial pendant lights have Edison bulbs encased in a metal cage. These are big enough to be task lights and charming enough to be decorative lights. Match it with the industrial decor theme kitchen or add it to your modern kitchen for added character. Buy this Now. Minimal and chic, this 5-piece pendant is perfect for an open-concept kitchen of your modern home. A sleek chrome-hued base holds 5 bare bulbs hanging from a thin wire. You can also experiment with the lengths of the wire and switch it to create a quirky look. This kitchen island pendant light can aid you in your dinner prep and also draw compliments from your guests. Buy this Now. Crafted from metal and wood, this kitchen pendant light showcases a distressed finish. This 8-Light Kitchen Island Pendant can be a great fit in a contemporary, minimalistic or even farm style kitchen setting. Buy this Now. 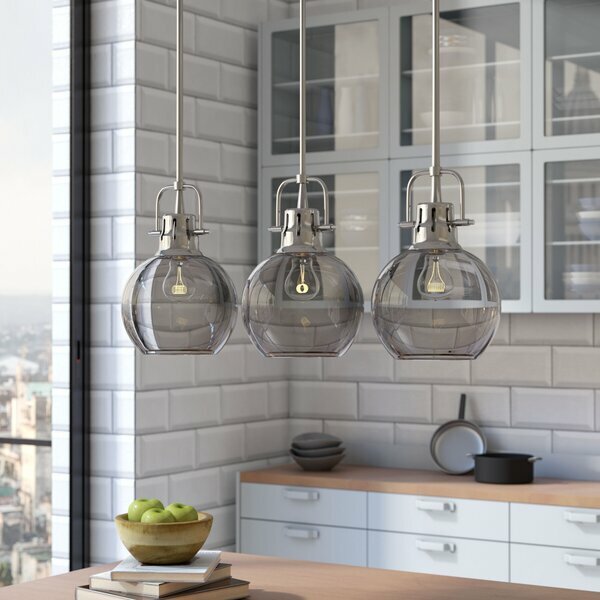 This contemporary-chic kitchen island pendant light has 3 smoke glass globes with Edison bulbs. The silver-toned metal rods and caps give it a sleek lantern-like look. 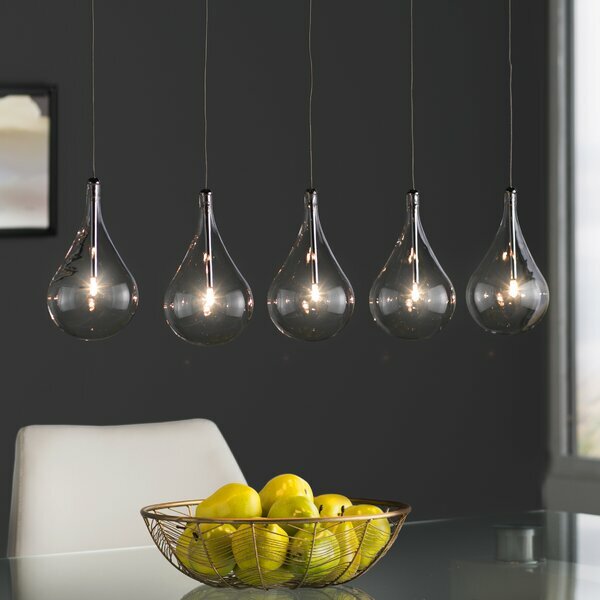 A modern kitchen will get a warm glow with these charming kitchen pendant lights. Buy this Now.